I have seen so many hogs butchered in my career that I can not even begin to count them. And the same thing always seems to happen with the ham; it is either cured into a country ham, ground for charcuterie, or ground for some sort of cooking. It has always bothered me that no one uses these beautifully large muscles for nothing else. I guess I can’t say never with any certainty in that no idea in the culinary world seems to be original. It is just my experience that other cuts of the pig seem to get more attention and ideas behind them. I have always wanted something more to do with the rear leg of the pig. I mean why not? We are always seeing the “Denver Leg” cut of venison or antelope which is the exact same part of the animal, just a different animal. So I decided with this last hog we got I was going to change the norm for my butchering world. I took one of the hind legs and deconstructed it. What I was left with was six muscles that would yield good portioned steaks, lots of meat for grinding, a good amount of fat for rendering, and great skin for pork rinds. I removed all of the silver skin, fat, and random bits from each muscle so they where beautifully lean. 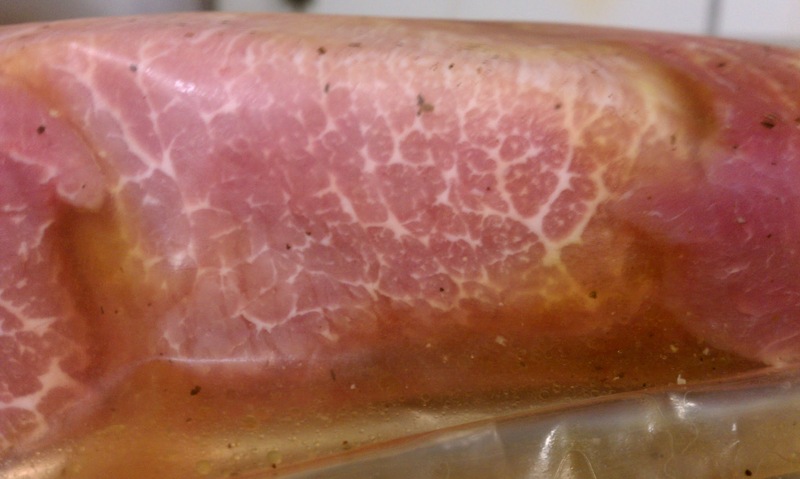 I say lean but as you can see from the picture there is a great deal of marbling still present. I then used a jaccard meat tenderizer on each of the portioned steaks. I did this for two reasons. The first being the obvious, hind leg meat is notorious for being a tough cut (just one of the many reasons they are so commonly NOT used as steaks), and the second is that in all the “Denver Leg” venison steaks, even from the top producers I have used, I saw the marks of a jaccard. Once prepped I heavily seasoned the steaks with salt and a twist or two of black pepper. I have to take a second here and explain why I say “heavily” when I refer to seasoning the steaks with salt. It has been my experience in sous vide cooking that if the protein, in particular pork, is not seasoned well then the end result is a bland taste. I can only equate this to the fact that many times pork is cooked with some time of liquid. Either stock, fat or some sort, or both are used in the sous vide bags with the pork. If this liquid is not seasoned, which neither a stock nor fat should be, then the liquid would of course absorb a degree of the salt thus reducing the amount the actual protein can absorb. I bagged the steaks with 4 ounces of pork stock (made from the bones of the same pig), a good slug of olive oil, and 1/2 cup of lard (rendered from the fat of the same pig). I also added 1 clove of garlic, 12 white peppercorns, and several sprigs of thyme. I cooked the steaks at 56.5 Celsius for 6 hours. To finish the steaks I seared them in a mix of lard and canola oil to caramelize the outside and heat the steak through. I will admit the first one got away from me and cooked a little longer than I wanted and ended up a solid medium well when finished. I nailed the second at a perfect medium. To my amazement both were fantastic. Tender, juicy, and loaded with wonderful porky flavor. And while the medium steak was obviously my favorite I would not have turned away the over cooked medium well by any means. Finished with a nice bourbon smoked sea salt and a new dish was formed. Now what to serve them with?